Romance is in the air in February in much of the Christian world as lovers celebrate St Valentine’s Day (14th February).European couples can treat themselves to short city breaks in amorous destinations. 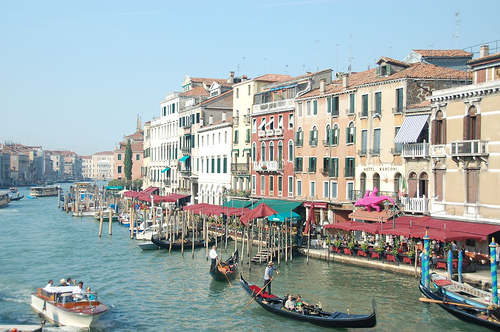 Often the favourites are Italian inspired, such as Venice, Florence or Lake Como. Paris is also highly desirable for strolls by the Seine and candlelit dinners. Of course the weather in Europe in February may not be all sunshine and roses, February being on the downside of winter, but the ambience and availability of luxury hotel packages makes up for the chilly drizzle outside, and champagne for two tastes good in any situation. In the United States, which is also not in the pink weather-wise in February, there are plenty of options for package-deal Valentine breaks - the most popular destination being Las Vegas, despite very cool weather, where the kitsch wedding chapels overflow with couples queuing to be married on the special day, and lovers fill every restaurant and luxury suite along the famous neon “strip” for the occasion. While most of the country hides from the cold indoors, Hawaii is all sun and surf as North Americans escape the winter cold and fill up the island beaches. February is also time for making merry with Mardi Gras and Carnival season in full swing. The New Orleans Mardis Gras is legendary with its lavish parades and wild French Quarter parties – one of the great experiences no seasoned traveller can afford to miss, in Louisiana, USA. Another great carnival –traditionally held so everyone can let of steam before the start of the privations of Lent – is the renowned Rio de Janiero Carnaval in Brazil, where the samba schools compete in gorgeous costumes amid a week’s worth of exhausting revelry in the streets. If a quieter February holiday is more to your taste, head for the sunshine in the tropics or the southern hemisphere. The Caribbean islands are magical with warm, sunny and dry weather in February – how about kicking off your shoes and chilling out in Barbados, Cuba, Costa Rica or Jamaica, where the sun shines on the sandy palm-fringed beaches. The British Virgin Islands and the Turks and Caicos Islands are two lesser-known, but equally paradisiacal island getaways in the Caribbean. For an African adventure in February why not think about a winter holiday in The Gambia, where it’s sunny for around 10 hours a day and the sands sizzle, washed by the blue Atlantic waters. There are some amazingly affordable holiday deals on offer for this little west African gem, where plenty of people speak English in the vibrant markets. In Asia there are plenty of options in February. Northern India has good weather and a visit to the magical Taj Mahal in Agra certainly fits the romantic theme! In south east Asia it’s still pleasant without the sapping heat of summer: a great time to marvel at the ancient site of Angkor Wat in Cambodia. Perhaps you prefer cuddling up in front of a log fire in a snowy hamlet to baking on a beach for your romantic Valentine getaway? Then opt for an Alpine ski resort with traditional charm. How about the French resort town of Val d’Isere, which is not only picture-postcard pretty but has some cosy chalet-style hotels and super skiing to boot?